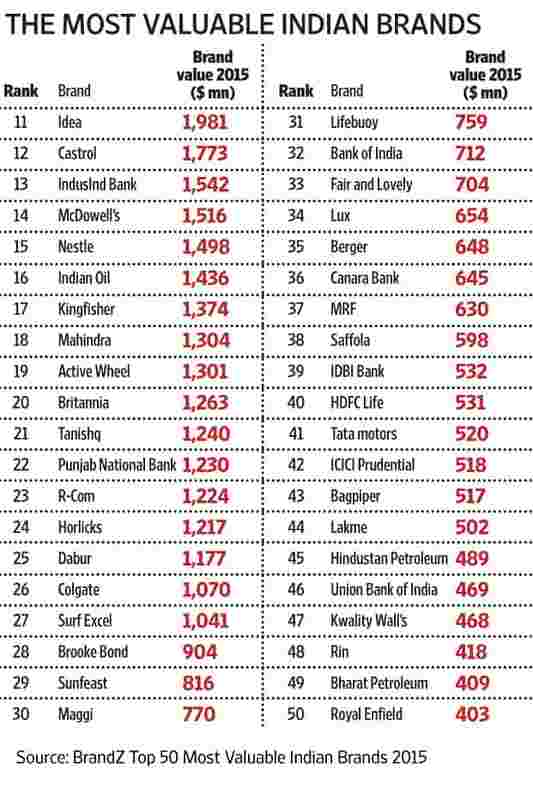 New Delhi: HDFC Bank Ltd, India’s second-largest private sector lender by assets, retained its top position in a list of India’s 50 most valuable brands released on Wednesday. The bank has a brand value of $12.6 billion, according to the second edition of the BrandZ rankings. Axis Bank Ltd, Canara Bank Ltd, tyre maker MRF Ltd and bike maker Royal Enfield are the four brands that figure for the first time in the rankings, compiled by research agency Millward Brown and commissioned by WPP Plc., the world’s largest communications services group. In the first edition of BrandZ, released in 2014, HDFC Bank ranked the most valuable brand in India with a value of $9.4 billion. Airtel, the mobile services brand of India’s largest mobile phone operator Bharti Airtel Ltd, remained in the No.2 spot with a brand value of $11 billion. India’s largest lender State Bank of India figured at No.3 with a value of $9.4 billion, followed by ICICI Bank Ltd ($5.1 billion) and Asian Paints Ltd ($3.9 billion). 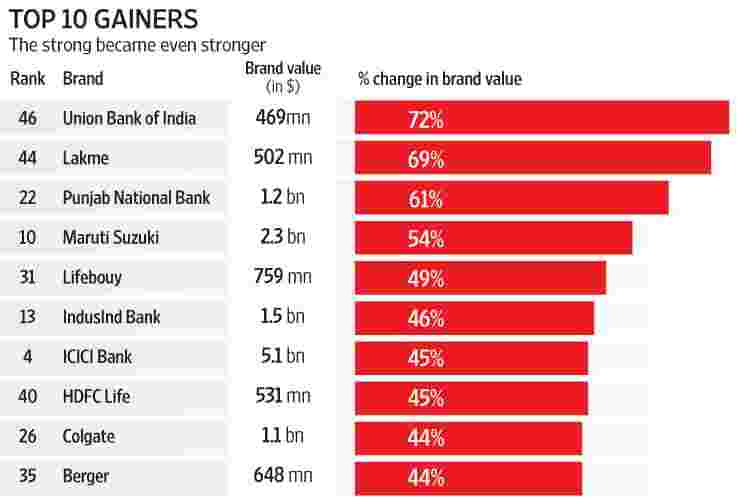 Among the top 10 brands, Axis Bank is the only new entrant. The list is dominated by banks and financial services companies. 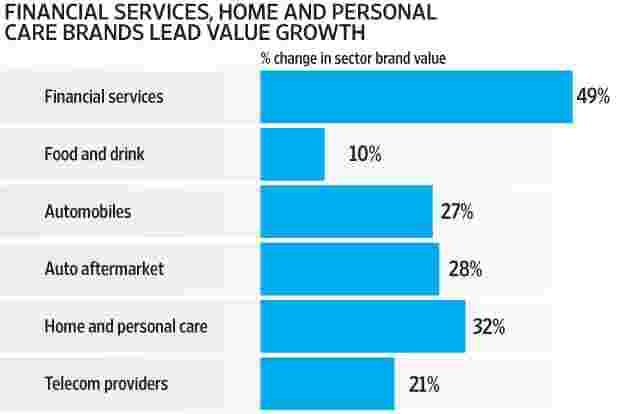 Of the 50 brands, 13 are banks and financial services firms, 12 home and personal care brands and 11 are food and beverage brands. The 13 banks and financial services firms account for 41% of the total brand value, representing an increase of 49% over the previous year, according to the report. The study said 30% of the top 50 brands in India are owned by multinationals. “The 2015 study shows that India is a market of great opportunities where consumers are empowered, and this is increasingly reflected in their brand choices," said David Roth, CEO of WPP unit The Store. “India is distinct in many ways from other fast-growing markets—strategies that worked elsewhere will not work in India," Roth added. “Any brand intending to compete in India must gain deep insights into its nuances—such as the need to modernize while respecting the past, and the desire to remain fundamentally Indian." The one big challenge brands face is to be ahead of consumer trends, he added. Union Bank of India gained the most in value with a 72% rise backed by digitization and customer-centric initiatives. The 33% increase in HDFC Bank’s brand value was backed by rapid rural expansion, increase in revenue, profit and cost optimization. Personal care brand Lakme’s value jumped 69% on the back of its ability to command a premium for its products. Despite the controversy over Maggi noodles, which had a ban clamped on it by the food safety regulator for allegedly containing monosodium glutamate and excess lead, Nestle India Ltd moved up one notch to the 15th spot this year from 16th last year. The ban was lifted by the Bombay high court in August. “We’ve stood for quality for 103 years and will stay for another 100 years. Going forward, the Internet medium will take the communication from brands to consumers. Competitors don’t intimidate. They energize," Suresh Narayanan, managing director of Nestle India, said at a CEO roundtable on BrandZ India held in Mumbai on Wednesday. Royal Enfield, the iconic motorcycle brand from Eicher Motors Ltd, secured the 50th spot. “We’ve made a brand which is aspirational, yet accessible. The average age of our consumers in last five years has changed from 38 to 28 years," Rudra Tej Pratap Singh, president of Royal Enfield, said at the CEO roundtable. Srini Gopalan, director (consumer business), Bharti Airtel, said, “Airtel is a brand that was built on consumer connect. Since the beginning, our campaigns always have (had) the key message on connecting consumers through different mediums and ways relevant to that particular time. Initially, it was voice, and now it is data. Studies like these also show that we are on the right track, and the consumer trust is with us. Brand building is more connected with how it connects with the consumers, and not just on years of existence." 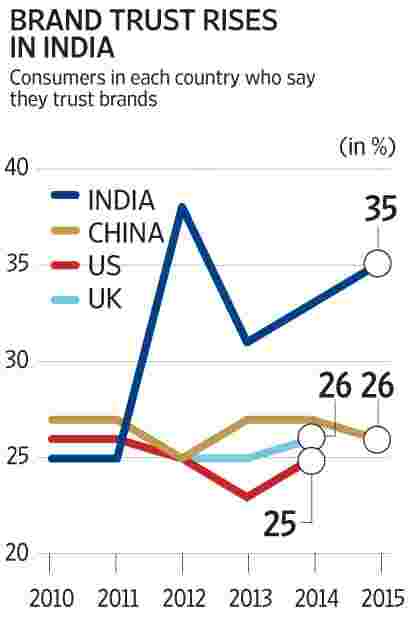 India is different from China and other countries in brand preferences. “In China, there are more local brands in the list, and there are technology brands. But multinationals take a good share in India," said Prasun Basu, managing director (South Asia), at Millward Brown. The other 30% of brands in the list are owned by multinationals that are publicly traded in India, noted the WPP study. “However, many of these brands have operated in India so long and effectively, they’ve established themselves as Indian brands in the minds of consumers, suggesting that the ‘Indianness’ of a brand depends more on how it’s perceived than on its provenance," it added. The study said brand leaders in two of India’s fastest-growing and most disruptive categories— e-commerce and mobile handsets—are expected to soon appear in the list of BrandZ Top 50 Most Valuable Indian Brands. “This is an emerging category, and e-commerce companies are investing in brand building. Over a period, e-commerce firms will emerge among the most valued brands in India," Basu said. According to the WPP study, Flipkart scores higher in features such as “meaningful, different and salient" in India than China’s Alibaba does in China and globally. The WPP study said that people who invested in these top 50 brands would have earned a better return than the ones who invested in Sensex companies. 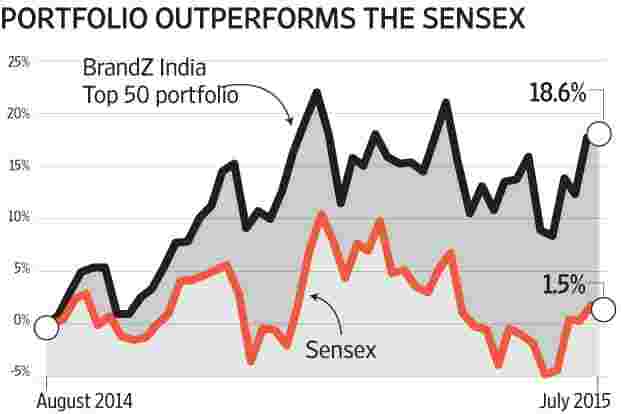 An investment of $1,000 in BrandZ India top 50 companies a year ago would have returned $1,186. In comparison, the same amount invested in Sensex companies would have returned $1,015. 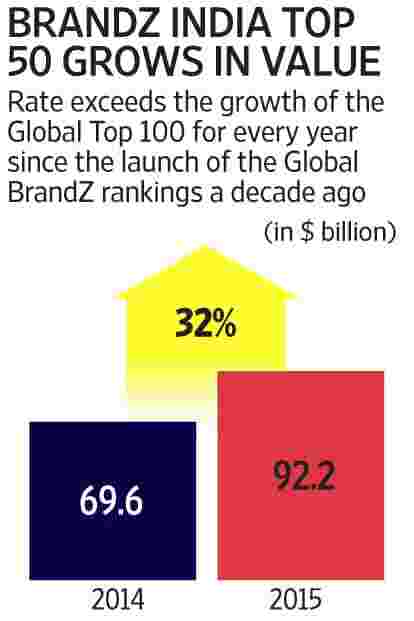 The study is part of the BrandZ series of brand valuations reports that include the Global Top 100, Indonesia Top 50, Latin America Top 50 and China Top 100 (to be released in February 2016). The brand value of India’s top 50 brands has increased by 32% in a year, according to the BrandZ rankings conducted by research agency Millward Brown and commissioned by WPP Plc. 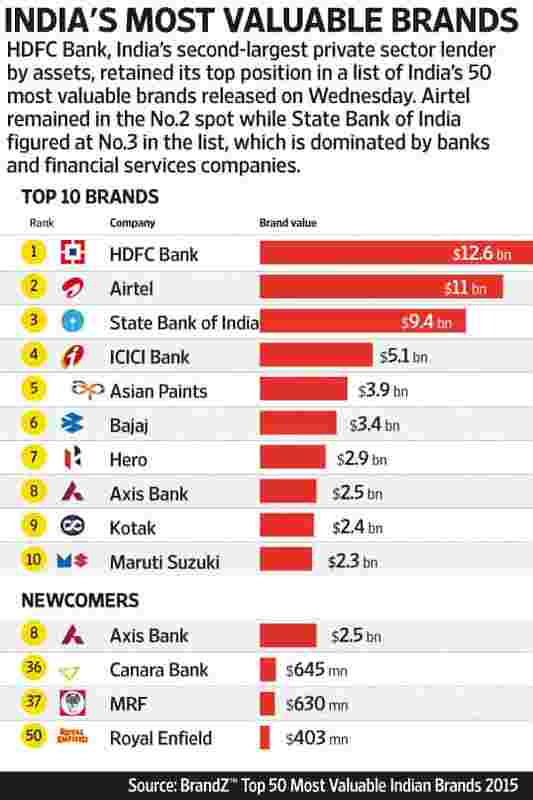 For the second year in a row, HDFC Bank topped the rankings dominated by banks and financial services companies, which took 13 places in the list and accounted for 41% of the total brand value.